Litho (or Lithography) Printing is one of the most widely used printing methods in the world. Using a sequence of four (or more) colour plates, ink is layered onto the page to create a smooth and crisp print finish. It's also the most cost effective way to print in large volumes. 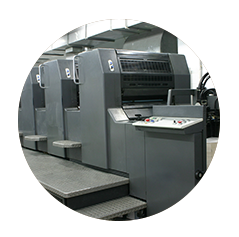 At CAB, we have five Heidelberg Presses that produce large volumes of litho printed media: from statements, letterheads, postcards, newsletters, brochures, leaflets, magazines, stickers and various forms of advertising materials. We print in one colour and/or full colour on a wide variety of paper sizes. We also have a range of finishing services, including: binding, die-cutting, folding, guillotining, perforating, scoring, numbering and barcoding. With over 40 years in the industry, you can be assured that CAB will continue to maintain only the highest levels of quality. In fact, we're so sure of our promise of service excellence that we commit to only charging our clientele for what they use each month - any form of wastage on the production line is for our own account! Quality: Litho is far superior to most other forms of printing, with fantastic colour reproduction. Speed: Prints can be generated in volume very quickly. Cost: Litho is by far the most cost effective print method. Choice: Printing can be done on a vast variety of paper stocks & weights as well as onto other materials and with an array of special colours and techniques.